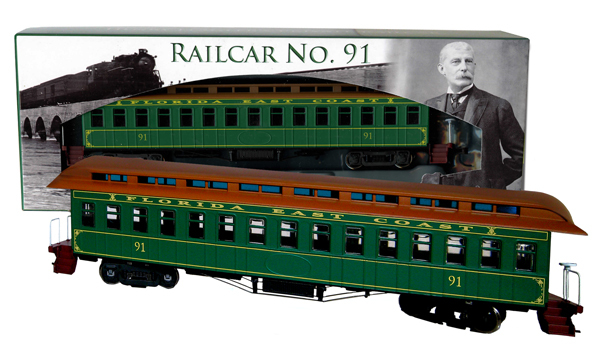 This HO scale railcar is modeled after Henry Flagler's private Railcar No. 91, now on exhibition in the Flagler Kenan Pavilion at the Flagler Museum. Railcar No. 91 was part of the first train to pull into Key West on January 22, 1912. The train heralded a grand celebration to commemorate the completion of his Over-Sea Railroad. Spanning 156 miles of mostly open ocean, Henry Flagler's Over-Sea Railroad was the most ambitious engineering feat ever undertaken by a private citizen and was hailed as the 8th wonder of the world.